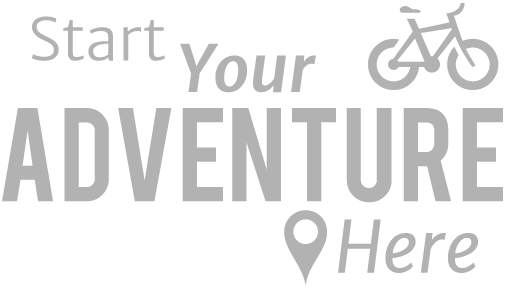 Itinerary | Cambodia and Vietnam Cycling Holidays and Cycling Tours Southeast Asia : Beginning with the ancient Khmer temples of Siem Reap and ending in the buzzing modernity of Ho Chi Minh City. You will be collected on arrival and taken to your hotel. There will be a group meeting with introductions and to discuss the trip ahead. 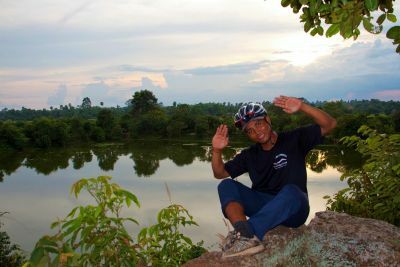 Your guide will do a bike fitting and provide an overview of Cambodia. Siem Reap is a riverside town with colonial architecture and the famous temple ruins of Angkor nearby. There is a military museum and an arts & craft markets to explore. This evening we take you to a local restaurant; you will hear more from your guide about traditional cuisine and Cambodian culture. We set off from our hotel, cycling through the Angkor pass check point. As we ride along shady road we may need to stop to re-inflate our tyres because of a few pot holes. The Banteay Kdei temple will come into view before we make a stop at the famous Ta Phrom shrine, encircled by the roots of enormous fig trees and gigantic creepers. We spend about an hour looking around the temple. Ta Phrom was built in the 12th century for King Jayavarvan VII and dedicated to his mother. Whilst clearing back the forest, archaeologists decided to leave the vegetation of Ta Phrom in place to serve as a reminder of how the Angkor temples were first discovered. Many trees have grown arouond and through the remains adn soar high above the temples. 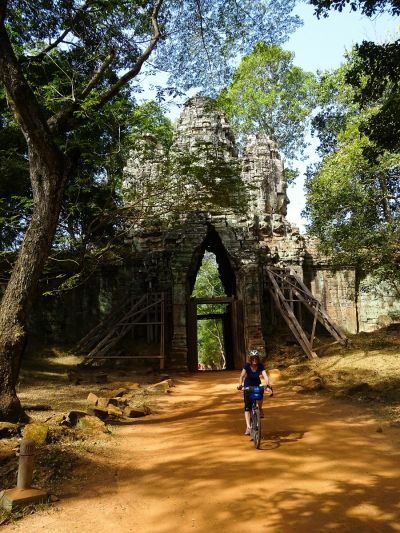 We continue cycling the small circuit, passing Ta Keo Temple, Chao Say Tevoda adn Tommanon before reaching Angkor Thom City. Angkor Thom was also built by Jayavarman VII. Here you will see the Terrace of the Leper king, the Terrace of the Elephant and Baphoun, Phimean Akas. We stop at Banyon Temple to have a look around (45 - 60 mins). 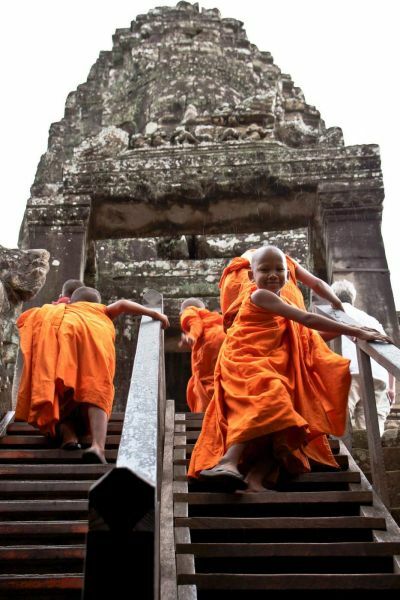 We will have lunch at the temple area before we visit Angkor Wat, one of the most famout temples in Cambodia. After that we cycle back to our hotel. From our hotel we cycle along Siem Reap river and out into the countryside to Kampong Phluk fishing village. On our way we pass a few Rolous group temples from the 9th Century, Bakong, Lolei, and Preah Ko. An ancient Khmer city here was known as Hariharalaya. We take a boat trip on the Tonle Sap (Great Lake) the largest freshwater lake in Asia. Back on shore we transfer back to our hotel in Siem Reap. We set off from the hotel riding 30km out, through a landscape of paddy fields on small dirt roads passing through Cambodian villages. We will be greeted by the smiling faces of local people. We stop to visit a silk farm then have a vehicle transfer to Bantheay Meanchey town for lunch and then continue to Battambong. Once we’ve checked in to our hotel, we have a late afternoon cycle out to the Bamboo Train. This is a unique railway. From O Dambong, 3.7km east of Battambang’s old French bridge (Wat Kor Bridge), all that remains of the track is 7km southeast to O Sra. The journey takes 20 minutes each way, with a 20-minute stop at O Sra Lav in between. Each bamboo train (nori) – consists of a 3m-long wooden frame, covered with slats made of bamboo powered by a petrol engine. This morning we ride to the villages just outside Battambang to learn about the lives of local people living along the river. We stop to see rice paper making, banana drying, rice wine and prahok production, we can sample one of the most famous snacks in Cambodia, the kralanh (sticky rice cooked in the bamboo pipe). We ride back to Battambang. After lunch we transfer by vehicle to Kampong Chhnang. Late this afternoon we will visit floating villages on Tonle Sap Lake. We set off from our hotel cycling to visit the pottery villages of Kampong Chhnang, we continue on riding through the rice paddy enjoying beautiful countryside. We make a stop to visit Oudong mountain, the Capital of Cambodia for more than 200 years from the 17th to the 19th centuries. The 2 mounds of the mountain are connected by a ridge and dotted with stupas and shrines dedicated to former kings. After visiting the mountain- top temple we will ride on quiet back roads through the countryside to our hotel. Today you are free to explore Phnom Penh. You can visit the sumptuous Silver Pagoda with 5000 silver floor tiles, located in the Royal Complex, the Royal Palace or the ancient Wat Phnom temple, set apart from the bustling streets. The city's Psar Tuol Tom Pong (Russian Market) or the art-deco Psar Thmei (Central Market) offer the opportunity to do some bartering. We cycle from our hotel this morning to catch a ferry boat across the Mekong. Disembarking we enjoy a 25km cycle ride through local villages where silk weaving is a principal industry. We take another ferry boat to Call Kah Oknha Tei Island and cycle through market gardens where crops of corn, papaya and mangoes grow. We transfer back to Phnom Penh and this afternoon, bidding farewell to Cambodia, we take a speedboat to Chao Doc in Vietnam. As we reach our destination, we’ll see floating houses, people washing clothes and children bathing in the river. Chau Doc's cultural diversity with mosques, temples, churches and nearby pilgrimage sites, makes it a fascinating place to explore. The area is defined by Sam Mountain a small but imposing pinnacle that rises dramatically out of the flat landscape. From the peak there are views right across the delta to Cambodia. The mountain is a sacred site for Buddhists, there are brightly painted temples and tombs and an unusual trail of ceramic dinosaurs that leads to the summit. A lookout tower is manned by Vietnamese military monitoring the Cambodian border. It possible to ascend the peak at dawn and watch the sunrise from the mountain top. We cycle along the Vinh Te canal to visit Ba Chuc killing fields. Pol Pot soldiers massacred over 3000 Vietnamese people here in 1978. An ossiary and memorial room mark these events. Our ride continues along the riverside where there are numerous brick kilns and we will see local workers farming the mud for brick production. We continue riding on village roads passing rice fields and frog farms. We will never miss the floating market in Can Tho, after the boat trip, then the bikes will be ready for you. start riding along the small path in rice fields, stop for photo and you can learn how the farmer planting rice and sometime you can see how they harvest it. Visit a Khmer temple and a lotus pond on the way where the guide will tell you the history of this site. We begin our day with a trip to the local floating market where we will see an array of fresh produce for sale. Back on dry land we set off, riding along small paths through rice fields. 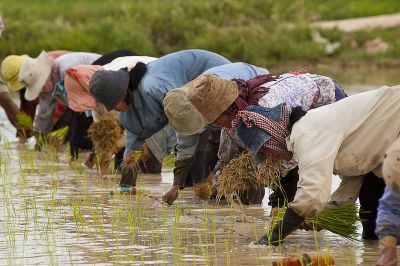 We make a stop to take photos and learn about the rice production and harvest. We cycle on to visit a Khmer temple and lotus pond on the way. The guide will give you the local history of the site. About 300,000 ethnic Khmer live in Tra Vinh province; they are Vietnamese speaking communities and there's nothing distinctively different about their clothing or life style however, Khmer culture thrives in these areas of Vietnam. There is also a small Chinese community in Tra Vinh, one of few that remain in the Mekong Delta region. Today we ride on paved country roads through the ‘coconut kingdom of Vietnam’, our route includes a ferry crossing, rice fields, and coconut farms. Our cycling ends at Ben Tre. Packing up the bikes we have a 2-hour transfer to our hotel in Ho Chi Min City. Our journey continues through small communities on quiet back roads, trails and paths. As we ride past rubber plantations and see rice paper making, we learn more about these village industries. Visiting Cu Chi our local guide will explain the workings of the tunnel network and what was essentially a subterranean settlement. Arriving at Cu Chi we have a guided tour. This war museum site of over 120 km of underground tunnels offers visitors a glimpse of the underground life of Vietnamese soldiers back in 1948; with trapdoors, living areas, kitchens, storage facilities, armoury, hospitals, and command centres. After the war against the French, Vietnamese soldiers expanded the tunnels and included effective air filtration systems, which helped them survive the Chu Chi carpet-bombings in 1969.
" This is a new trip for 2019..."